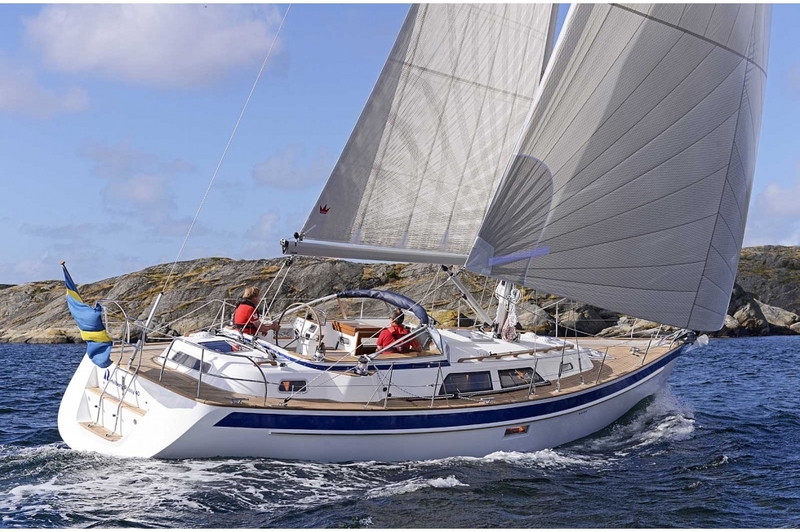 The Hallberg-Rassy 40 Mk II offers great comfort and sailing characteristics for long distance sailing. The Mk II interior layout offers many improvements such as more headroom in the walk through to the aft cabin and more natural lighting and ventilation. 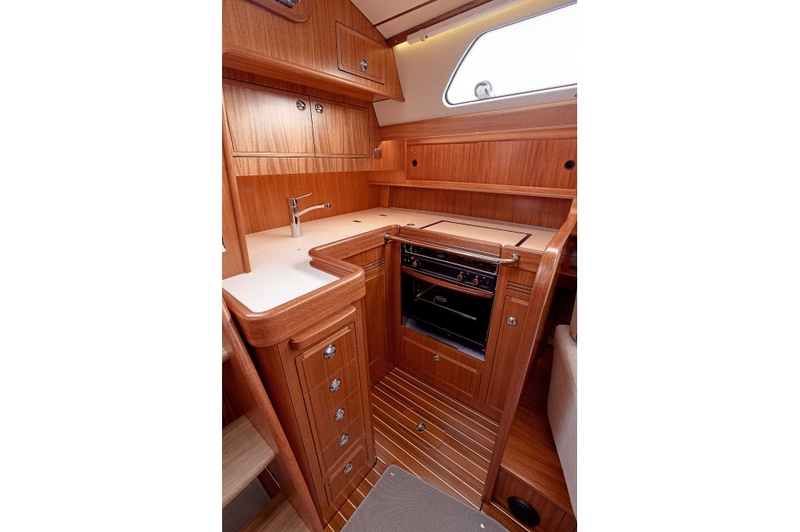 She has great storage space and can be fitted with many amenities such as a generator, washer/dryer, retractable 32” TV, even the famous Hallberg-Rassy Armchairs in the saloon. The boats mechanical systems are housed a very generous sized engine room. This allows for easy access, easy maintenance to the vessel’s mechanical systems. There are many improvements compared to the previous 40.
high load areas which has solid laminate. Integrated rubbing strake with brass strip. Blue decorative band in gelcoat. areas and also cockpit are of sandwich construction, solid in parts, laminated to the hull. lifelines. Two scuppers on each side which drain rain water overboard just above waterline to prevent dirt strips on the hull. winch, size 30 Evo Chrome Selftailing. Hatches to forecabin, saloon and in aft cabin. 11 portlights, 6 of these are opening. cylinders. Integrated bathing platform in transom. handholds, opening centre section and sprayhood over front part of cockpit. The sprayhood can be rolled away neatly into a protective cover. On either side of sliding hatch there are useful teak covered work surfaces, ideal as chart tables, etc. Above the sliding hatch instruments from Raymarine i50 Speed, i50 Detph and i60 Wind. Chart tables and washboards in natural teak. Two washboards, the upper one louvered for ventilation. The washboards stores in the cockpit locker. Two large cockpit drains. rodkicker, backstay tensioner and turnbuckles. Three winches; one for reefing, two selftailing for main and jib halyards. Several cleats for various uses. Spinnaker boom track for spinnaker boom is supplied as standard. 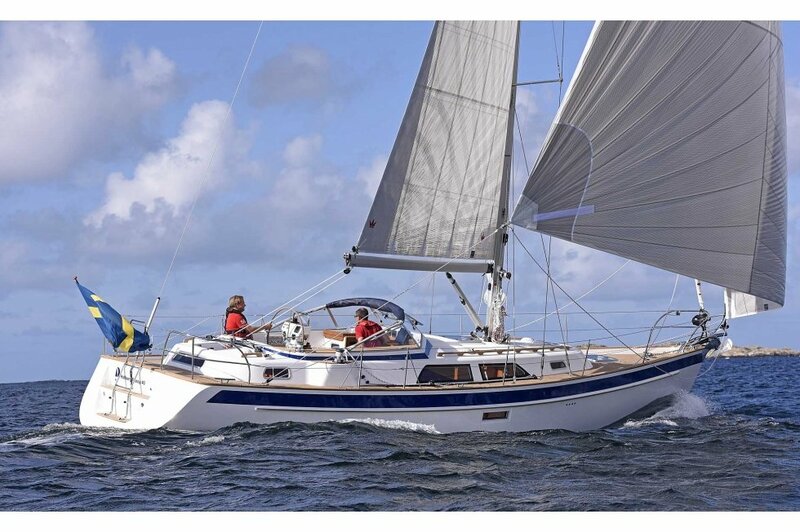 Generous dimensions of standing and running rigging avoid fatigue during unrestricted ocean sailing. Winches from Lewmar. Deck light. Windex wind indicator on mast top. Denmark. Two reefs in main, battens and coded sail bags. 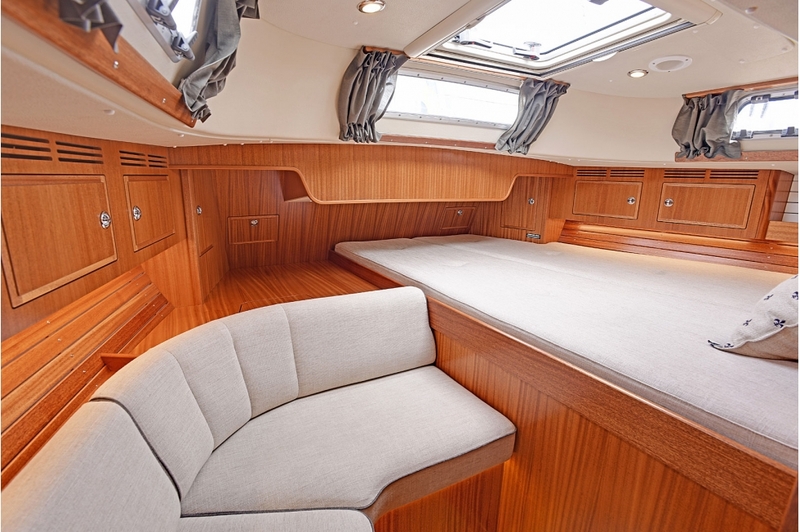 As standard the boat has two saloon sofas and two separate aft cabin berths. 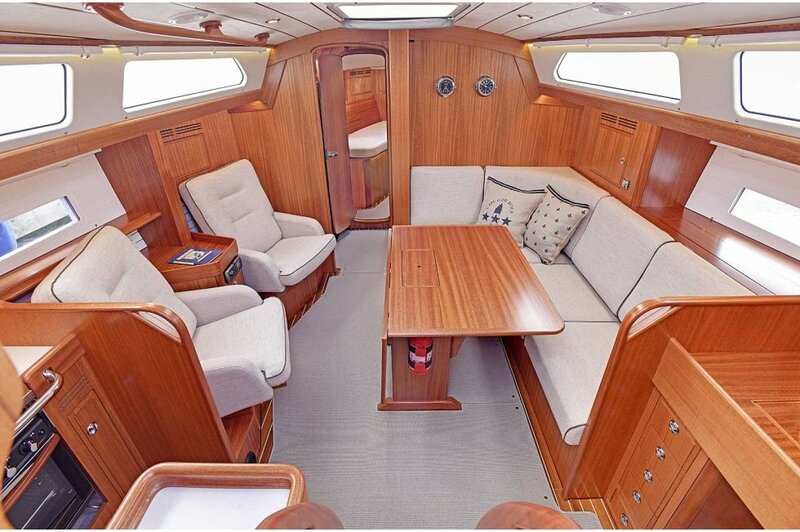 As an option at additional cost, there are two armchairs available in the saloon and, also optional at additional cost, a centre island berth in the aft cabin. You may combine the saloon of your choice with the aft cabin of your choice, so that you in reality have four layouts to choose from. If armchairs or centre island berth is required, this must specifically be ordered and confirmed. well ventilated boards to avoid condensation. Handholds are in all the right positions. All side portholes are fitted with curtains. Curtains also under the skylights. The settee offers comfortable seating. On port and sb side a 2.00 m / 6’ 7’’ long sofa, both with backrests with upper hinges. On port side so that the whole width of the berth can be used for sleeping accommodation. The Stb side sofa is L-shaped. Between the settees a strong table with foldable sides. Top opening bar in the table. Headroom in saloon 1.92 m / 6’ 3 1/2’’. Big working surface in composite stone with strong, all round mahogany fiddle rail. Carefully insulated icebox with basket and water cooled electric compressor for chilling. Extra deep, double sink. Twin burner gas cooker with oven, well gimballed with fiddle rails and locking device for oven door and also for the cooker when in use in the marina. Electric lighting of burners, no matches are necessary. Safety switch on gas pipe. Crockery locker and cutlery drawer. Bread board. Room for saucepans and other kitchen utensils. There are special places for the waste bin and other items. Bulkheads and lockers in white laminate. Teak grating. Wash basin and work top in composite stone. There is a large mirror. Separate shower with water tight shower stall. Shower water drained by pump directly overboard without going into bilges. well as a electrolux type vent. Headroom 1.93 m in the shower, 1.92 in heads compartment. 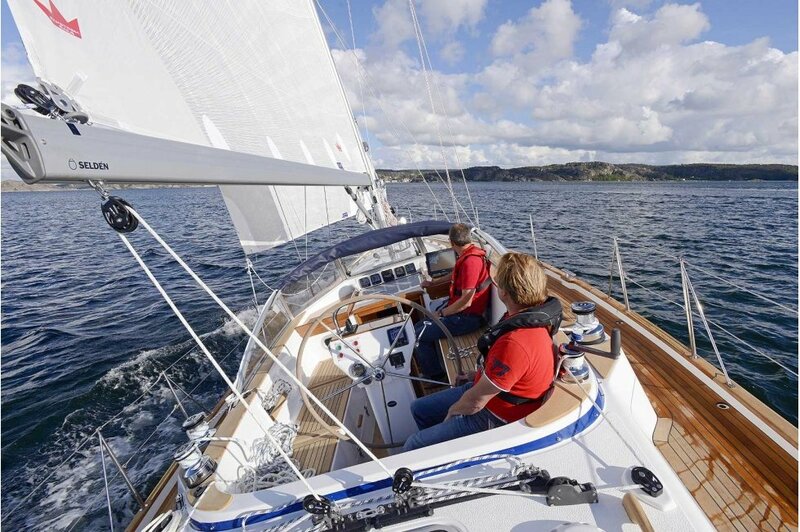 2.05 m/6’ 9’’ long berths with ample stowage above and below and in addition a number of lockers. Hanging locker and vanity. Two opening skylights with curtains under. A comfortable work table seat with spacious chart table. Electric panel to the right of the navigator. There are drawers and stowage slots. Two bookshelfs towards the engine room. 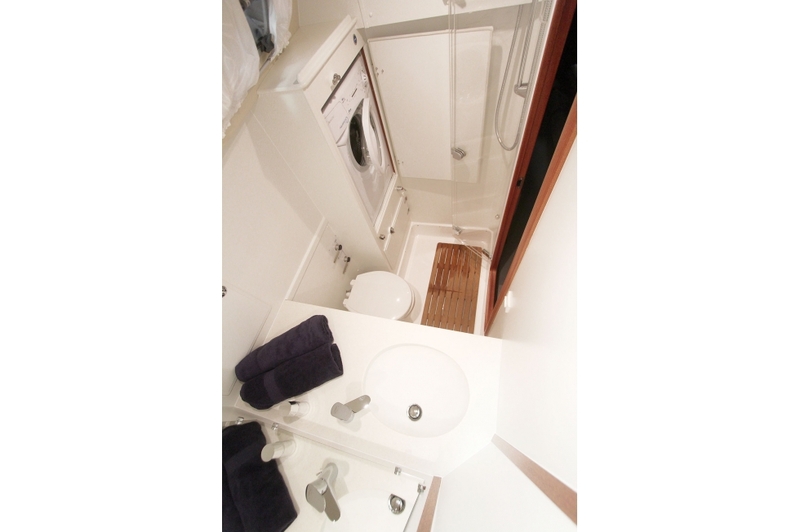 starboard, or a long and wide bed on port side and sofa to starboard is available. water tank. Due to the good insulation water remains hot for many hours after the engine has been run. The engine is served by a separate 75 Ah 12 V battery. There is a large filter for cooling water. The bilge pump has been installed in a position where it can be cleaned even in extremely bad weather conditions. ing range in calm waters is approximately 920 nautical miles. emergency bilge pump that is floodable. lights and steaming light with switch on the panel for extra safety. The electric panel has provision for additional outlets. 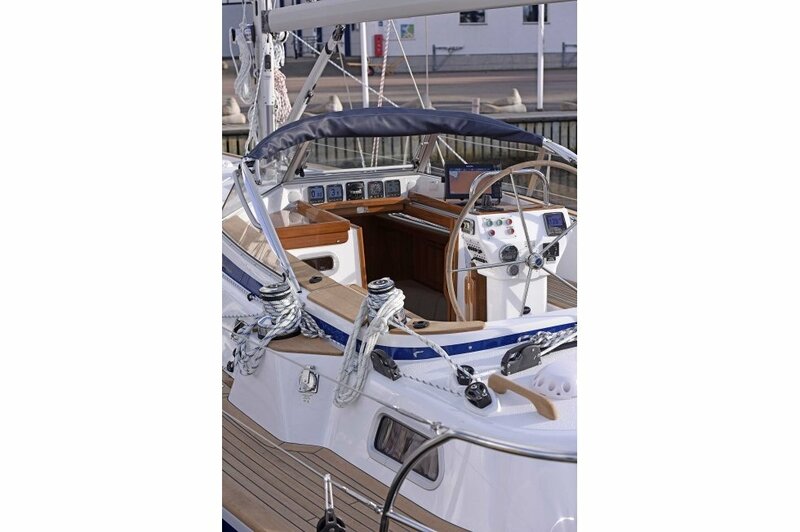 A wiring diagram is supplied with each boat. A water cooled Isotherm SP system with 12 v Danfoss compressor unit for refrigeration, extremely economical to run. Five hatches, six opening port holes, companionway washboards, totally six automatic vents in the saloon, on the foredeck, in the heads compartment and in the aft cabin. Wheel steering with leather covered steering wheel. Cardan linked rod steering which is progressive combines safety and fine feel in the best possible way. Emergency tiller. Illuminated compass and single lever engine control. 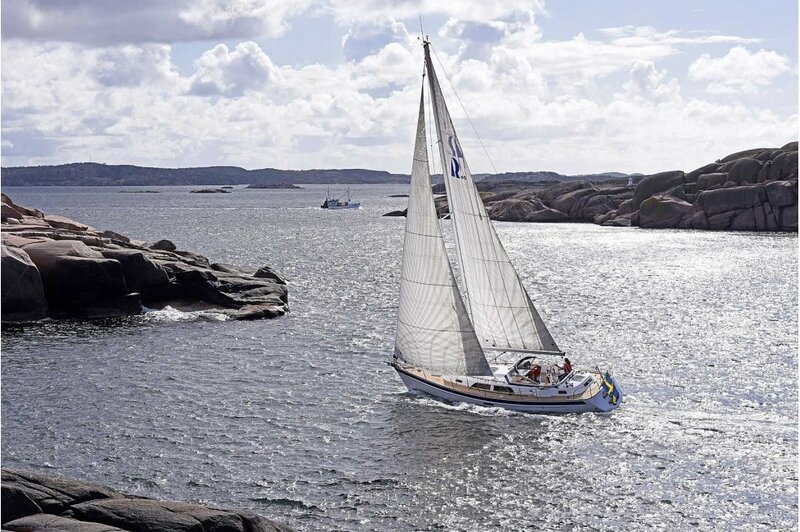 The boat is delivered with a CE certificate and a CE plaquette for category A (unlimited ocean voyages). 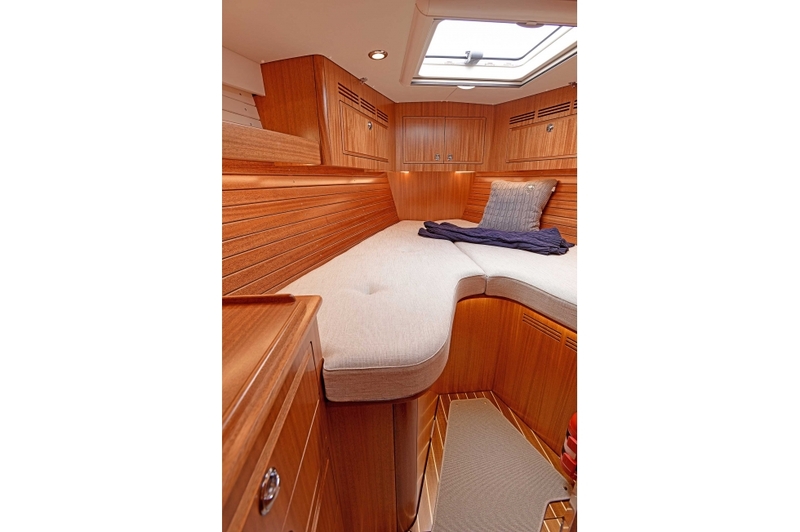 - Starboard side settee to enable full width of berth to be used for sleeping as on port settee. Straight corner.